As a first-generation high school and college graduate, Dr. Leah van Belle is deeply committed to supporting urban schools and believes that education is one of the most powerful tools for educational access, equity, and social justice. Leah serves as the Director of School Partnerships and Clinical Practice at Wayne State University. In this role she develops and maintains partnerships between the college and PK-12 schools, with emphasis on co-constructing clinical models of urban teacher preparation. She designs and leads professional development for university clinical instructional coaches, teaching interns, and PK-12 mentor teachers. She is part of the team co-designing The Dream Keepers, an urban teacher residency program in partnership with Detroit Public Schools Community District and the Michigan Dept. of Education. 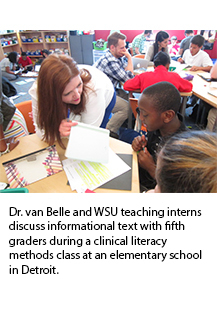 Leah teaches clinical literacy methods in an elementary school in Detroit in collaboration with a grade 5 teacher; interns in the course develop their teaching skills in a meaningful clinical context. Leah is the lead instructor for Becoming an Urban Educator, which includes apprenticeships and social justice inquiry projects in Detroit schools. Among Leah's research interests are urban education; culturally sustaining pedagogy, literature, and curriculum; clinical models of teacher preparation; PK-12 teacher preparation and professional development; university-school-community partnerships; and literacy education. The impact of microaggressions in higher education. Workshop. *van Belle*, L., Miles, B., Kos, P., & Salemassi, F. 2014 Madonna University, Livonia, MI. Take guided reading to the next level: Coaching readers. Presentation at Michigan Reading Association’s 58th Annual Conference. *van Belle, L.A.* 2014 Grand Rapids, MI. Beyond narratives: Teaching persuasive reading & writing. Presentation at Michigan Reading Association’s 58th Annual Conference. Invited panelist for Reclaiming the conversation: Teacher preparation and induction: Exploring current and future trends in teacher training. *van Belle, L.A.* 2014 Metro Bureau of Schools, Metro Detroit, MI. “What do you mean I’m going to co-teach with another intern for student teaching?”: Paired internships as a model for the preparation of effective urban educators: Learning from clinical medical education. Asking ourselves the tough questions: Reimagining teacher preparation through clinical practice. Paper presented at the 69th Annual Conference of the American Association of Colleges of Teacher Education. TeachDETROIT: Partnerships for preparing teachers and supporting student achievement. Presentation at the 60th Annual Conference of the Michigan Reading Association. Crawford-McKinney, K., McIlhagga,, K., & *van Belle, L.A.* 2016 Detroit, MI. Invited panelist for Legislative Session on Teacher Preparation at the 60th Annual Conference of the Michigan Reading Association. *van Belle, L.A.* 2016 Detroit, MI.